As I’m sure many of you are in the trenches of the “hood”, parenthood that is..then I’m sure you understand where I’m going with this! Parenting is hard, it’s legit one of the most time consuming, demanding things you can do! I can not imagine parenting without my husband! Now don’t get my wrong, I understand that not everyone is in a position to have a partner there everyday and let me tell you I get that! I was raised by a single mother who became widowed at a very young age with 2 small girls. So trust me when I say it doesn’t have to be a “marriage” partner but by all means please find your self some support. Parenting is not something you want to walk through alone with no branches of support! I never realized how hard parenting could be and as I get further & further into it I have really figured out that it only gets harder. The sleepless nights quickly change in to attitude adjustments, time outs and figuring out how to deal with all of those little hormones that are making your 4 year old act like a 16 year old. And I always hear that the days I’m in are the ones to cherish because the teenage years are even harder….dear Lord help me! Find someone, someone who understands your style of parenting, someone who is in the same stage of life as you, someone who loves your kids like you do. Find someone who will come fill your cup when its empty or let you go get some time to fill your own cup but find someone who invests in you & your family! It could be a friend, a sister, a grandparent, really anyone you trust to have your & your kids best interest at heart. My husband is seriously my rock. Staying at home all day with 3 kids 5 and under can sometimes get a little cray, like my husband can walk in the door and see it all over my face if today was a struggle. To be honest most of the time it is, but the moment I see my “team” walk through the door I know we can handle this parenting thing together. I am so thankful for our relationship and how it helps me grow as a mother. 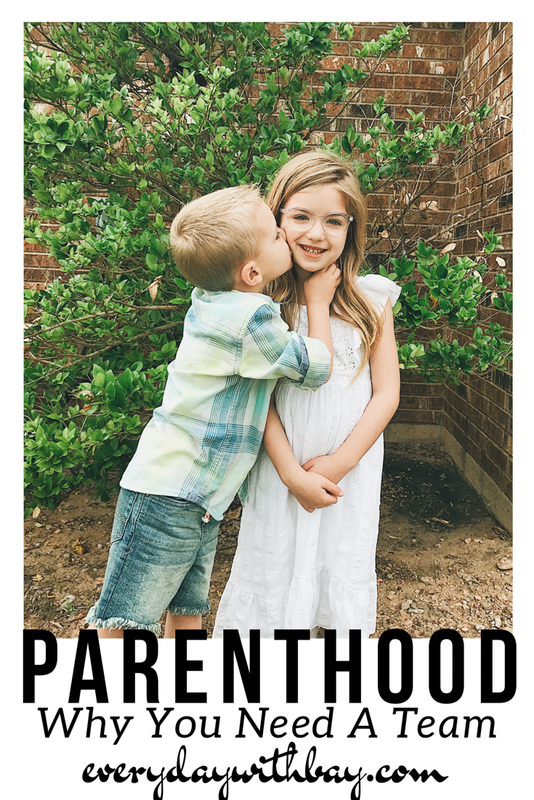 He gets me, he gets them and we figure out how to make it work even if we do lay in bed sometimes and ask each other if we are going to survive this thing called parenthood!